Want to increase visibility with a more collaborative, real-time dashboard? A dashboard report is a powerful tool for meeting business objectives, displaying vital company data in a one-page layout. Excel dashboards typically include multiple spreadsheets. One is the actual dashboard, the front-facing page which graphically displays information using tables, charts, maps, and gauges (also referred to as speedometers). The other spreadsheets in an Excel dashboard hold the data that is being tracked and the calculations that are being used to analyze that data. Excel dashboards can look quite different depending on business needs. To get you started with a dashboard, we’ve compiled the top Excel dashboard templates (compatible with earlier versions of Excel, including Excel 2007 and Excel 2010) that you can download for free. We'll also show you an easier way to make a dashboard with Smartsheet, an online work management tool. 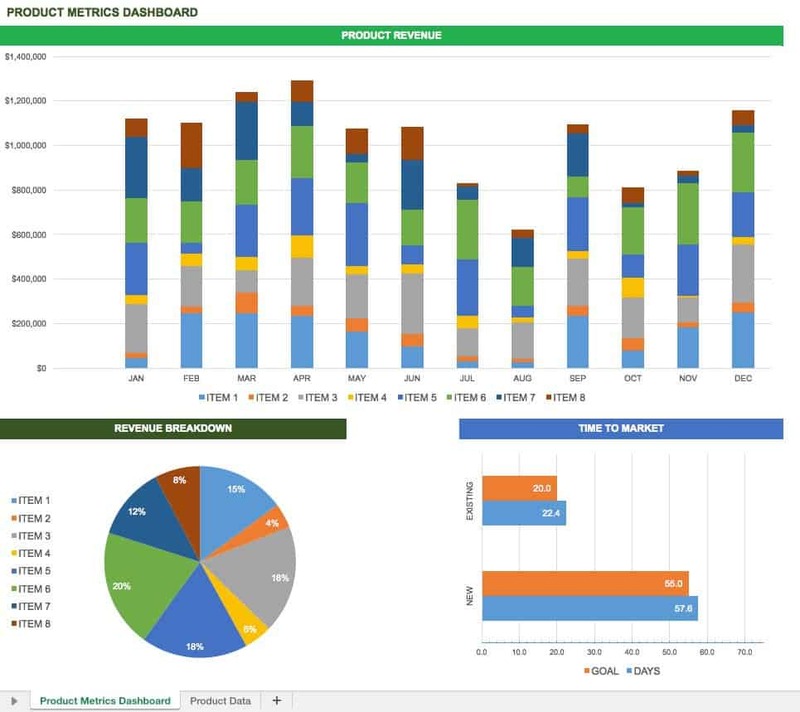 Track key data points using a KPI dashboard to maximize business performance. You’ll save time by not having to produce multiple reports, and the consolidated metrics can easily be shared between teams. This free KPI dashboard template allows you to view multiple KPIs in both table and graph formats. Compare performance between selected KPIs and view averages and targets per KPI. The dashboard design is simple and easy to read. Create a visual representation of sales results in order to boost performance, create accountability and track progress. Any process is easier when you can make data-driven decisions, and sales management is no different. 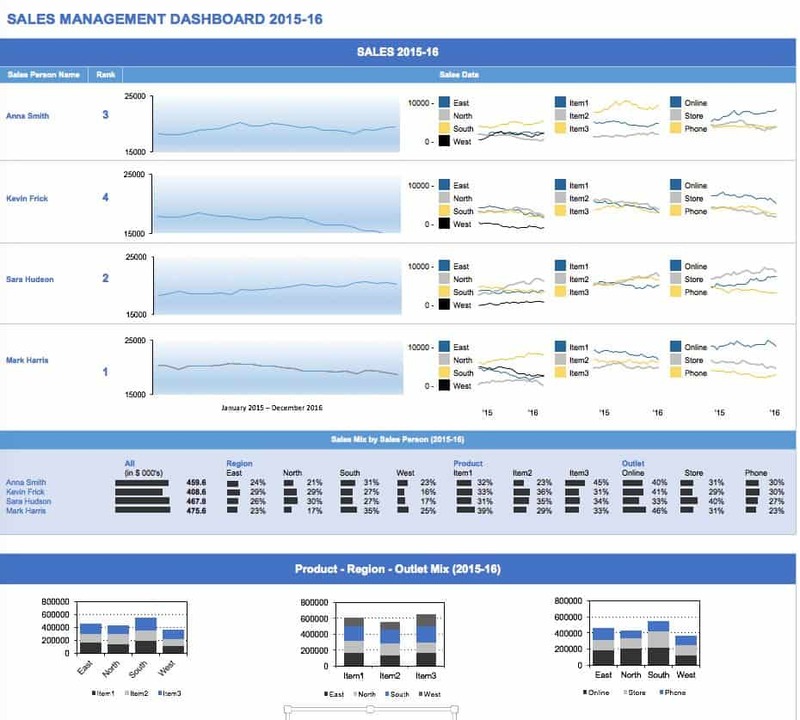 This free sales management dashboard template allows you to track sales based on product, region, and customer type. 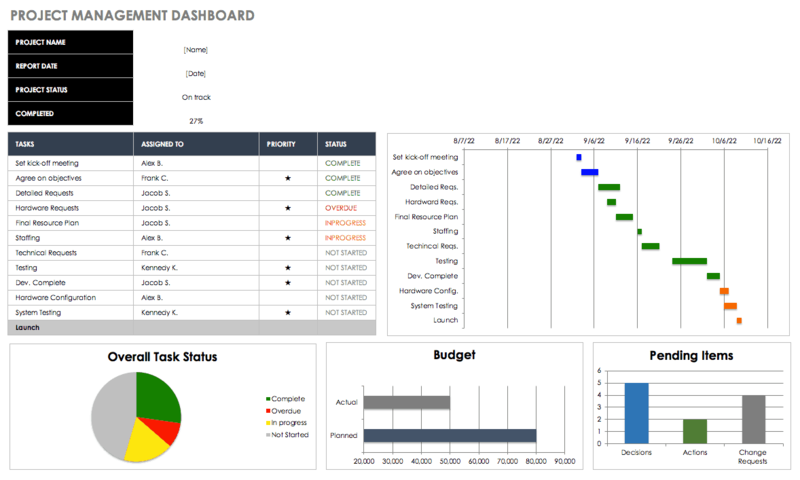 A project management dashboard allows managers to stay on top of multiple aspects of a given project and view them in a single snapshot. Tracking issues, activities and progress becomes much easier when the data can be compiled and viewed as a dashboard. Not only does this help streamline project management, but it makes it easier to provide up-to-date project status reports or share information with team members. Key metrics provide product information not only to product managers, but also to stakeholders and others within an organization. This data could include metrics related to monetary performance, customer interaction with a product, or other business goals. Once you’ve identified the key metrics and KPIs for your products, you can track them using a product metrics dashboard. This free template offers a simple interface for tracking and visualizing information. Unlike a project management dashboard, which focuses on data for a single project, a project portfolio dashboard displays KPIs for multiple projects. 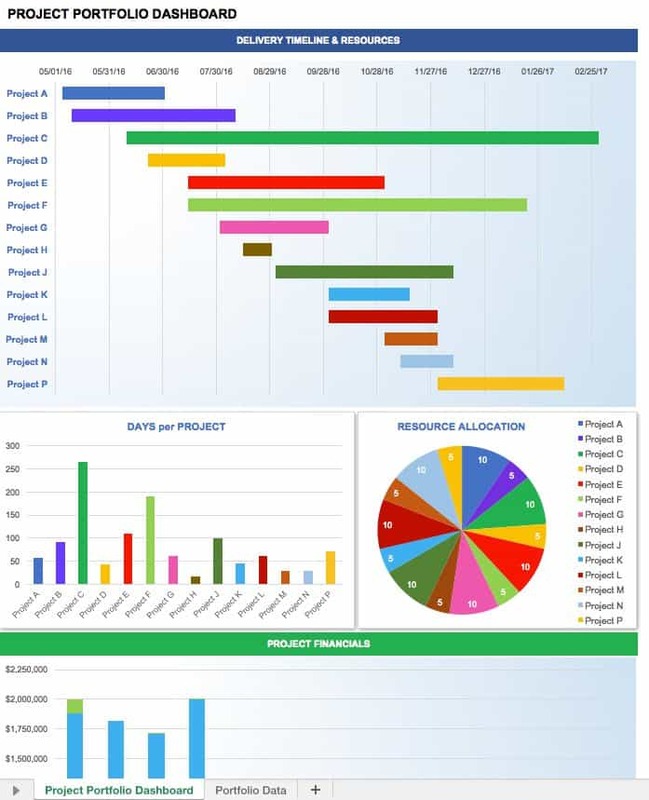 This provides a status overview for all projects underway, showing which projects are on schedule and what issues need to be addressed. You can easily track budget, risks and other key project parameters. Use this free template as-is to manage your project portfolio, or customize it to meet the needs of your organization. Although you can create a dashboard in Excel, it typically takes multiple templates to provide an all-up view and it can be tricky to know whether you are looking at the most up-to-date information. One tool that enables you to create customized, real-time dashboards is Smartsheet, an enterprise work management platform that fundamentally changes the way teams, leaders, and businesses get work done. Over 74,000 brands and millions of information workers trust Smartsheet as the best way to plan, track, automate, and report on work. I'm using this templates and are very usefull, in a while tell you the result regards! Thanks a million for providing this type of a service.